In their sixth season trying to return to the Alpha Quadrant, the crew of Voyager continues to find signs that they may be close to home. They ran across another Federation starship in the season 5 cliffhanger, "Equinox," which is concluded in action-packed fashion. Then they benefit from a brief communications link to home thanks to the ongoing efforts of The Next Generation's Lt. Reginald Barclay (Dwight Schultz), occasionally assisted by Counsellor Troi (Marina Sirtis). "One Small Step" sets Voyager on the trail of NASA's first manned mission to Mars (one of the bonus features details Robert Picardo's post-Trek work with NASA). 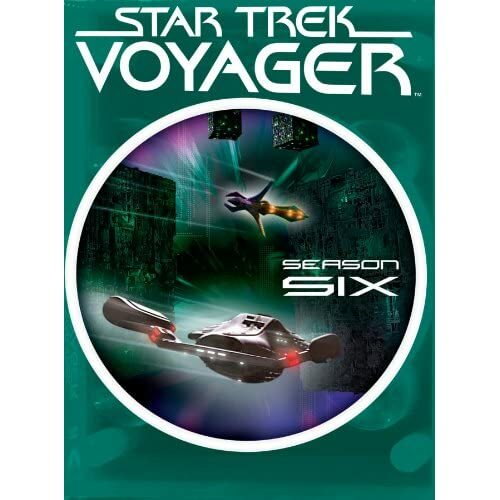 In other episodes, Torres (Roxann Biggs-Dawson) tests the limits of Klingon honor ("Barge of the Dead"), Tuvok (Tim Russ) stretches his emotions ("Riddles), Paris (Robert Duncan McNeill) and Kim (Garrett Wang) embark on a new holdeck program, wrestling superstar the Rock makes a gimmicky guest appearance ("Tsunakatse"), a former crew member returns ("Fury"), and the crew discovers a group of abandoned Borg children ("Collective"). The two most interesting characters continue to be the Doctor (Picardo) and Seven of Nine (Jeri Ryan). The former stretches out numerous times ("Tinker, Tailor, Doctor, Spy," "Virtuoso," "Life Line"), and we learn more about Seven's Borg past in "Survival Instinct" and the season closer, in which Seven discovers that during regeneration she can enter a dream world called Unimatrix Zero. There she meets a number of mutated Borg who can exist in this world in their pre-assimilation state and who also present an idea for destroying the collective from within. The Borg Queen, however, discovers the plan and ends the season in a nightmarish cliffhanger that recalls the great Next Gen episode "The Best of Both Worlds."